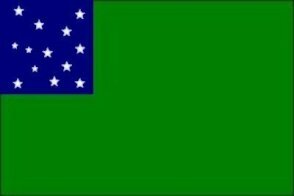 The Green Mountain Boys Flag was the regimental flag of a group of militiamen in the colonial New Hampshire Grants territory, an area between the colonies of New Hampshire and New York that eventually became the State of Vermont. 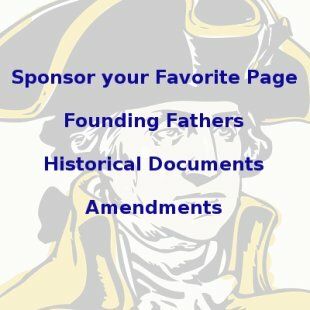 The Green Mountain Boys served under Ethan Allen and captured key forts at Fort Ticonderoga and Fort Crown Point early on in the war with their numerous cannons, howitzers and mortars, which were later transported across the rugged mountains to the heights around Boston, where they helped General George Washington drive the British army out of Boston. The Green Mountain Boys Flag has a dark green flag with a navy blue canton, the upper left corner. 13 stars represent the thirteen colonies on the canton, arranged in a random pattern, as opposed to an ordered pattern in flags such as the Betsy Ross Flag or other 13 Star Flags. The Green Mountain Boys formed their militia group to protect their land grants from attempts by New York to control their land. New Hampshire had given local settlers the land grants, but in a legal dispute, the land was officially given to New York by the British government. New York made various attempts to settle the area and to enforce the law, but Ethan Allen and his Green Mountain Boys successfully repelled them, sometimes with violence. They were made up of a tight knit group of settlers consisting of many friends and family members, including Allen's cousins Seth Warner and Remember Baker. After the Declaration of Independence was declared, the area declared itself not only independence from Great Britain, but an independent republic, the Vermont Republic. It joined the United States as the 14th state in 1791. One month after the Battles of Lexington and Concord, the Green Mountain Boys took over the small British garrison at Fort Ticonderoga on the southern tip of Lake Champlain, which lay between the New Hampshire Grants and the colony of New York, in an early morning operation that left no casualties but one injured soldier on the American side. When asked by Lieutenant Jocelyn Feltham, assistant to Captain William Delaplace, by whose authority they were taking the fort, Ethan Allen replied, "In the name of the Great Jehovah and the Continental Congress!" The Green Mountain Boys marched under the Green Mountain Boys Flag and the command of Ethan Allen and Colonel Benedict Arnold. Colonel Arnold was appointed to lead the takeover of the fort by the Massachusetts Committee of Safety, but the local men were loyal to Ethan Allen and said they would not serve under anyone else but him. Allen and Arnold agreed to work together so the capture of Fort Ticonderoga could be accomplished, but they competed for the glory of the capture afterwards. In the days after capturing Fort Ticonderoga, Allen's and Arnold's men also captured nearby Fort Crown Point, Fort George and Fort Saint-Jean. The colonists confiscated a large number of cannons, ammunition and the largest British ship on Lake Champlain, the HMS Royal George, a seventy-ton sloop. The four forts were strategically important because their capture gave the colonists control of Lake Champlain, cutting off the main communication route between British troops in Canada and those deep in the heart of "patriot" territory. Removing Lake Champlain from British control also removed it as a main route by which British troops could come up from the interior to relieve the troops trapped in Boston. The most important contribution of the Green Mountain Boys, however, was the capturing of cannon, howitzers and ammunition that were eventually rolled over the New England mountains by Colonel Henry Knox to Dorchester Heights and other points surrounding Boston. Boston was occupied British troops, but they were trapped there by George Washington's Continental Army, which was surrounding the city. The introduction of the cannons on the highest spots around Boston severely limited British options. 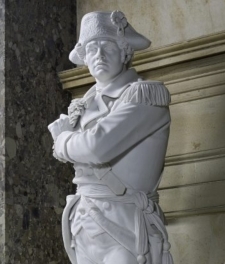 General William Howe eventually decided to abandon the city. In August 1777, the Green Mountain Boys led by Colonel Seth Warner joined General John Stark to crush a British raid on the military supplies held near the town of Bennington, Vermont. The battle was a major victory for the colonists because it reduced British General John Burgoyne's forces by nearly 1000 men leading to his eventual surrender at Saratoga in October, which in turn led to France joining the war on the Americans side. Historians believe the Green Mountain Boys Flag was carried by Warner's Green Mountain Boys at the Battle of Bennington. 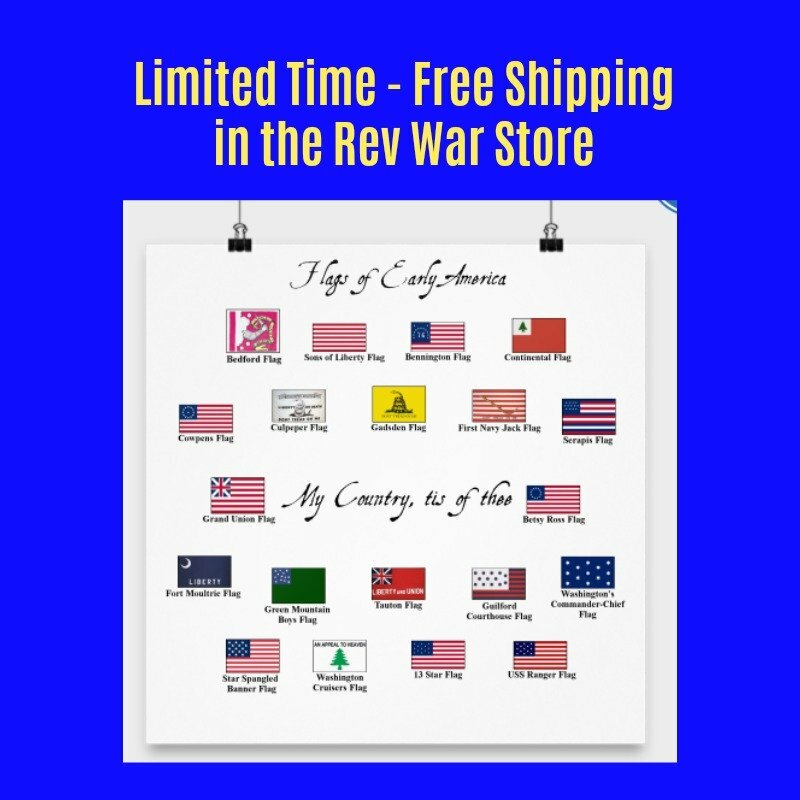 The battle has become more closely associated, however, with the Bennington Flag, a flag that most historians believe was not even at the battle! More on the Bennington Flag here. The Green Mountain Boys Flag still serves as the regimental flag of the Vermont National Guard. Remnants of the original flag, as well as remnants of the original Bennington Flag, are held at the Bennington Historical Museum in Bennington, Vermont. 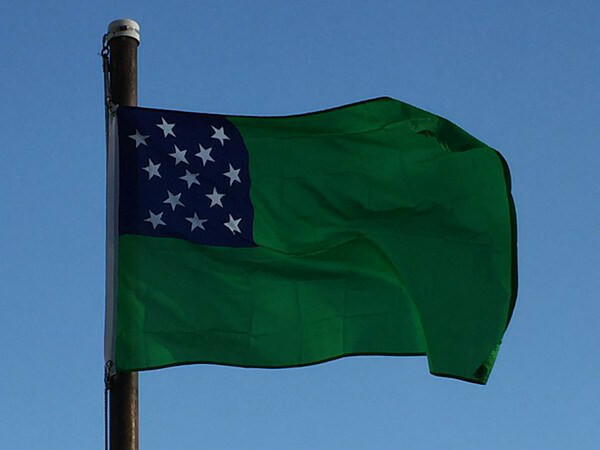 Order your very own Green Mountain Boys Flag here and help support this website with your purchase.